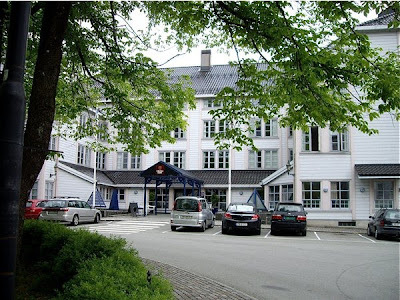 I have always wanted to stay at Clarion Hotel Tyholmen in my hometown Arendal. It has one of the most beautiful locations you can think of, and a lot of character. 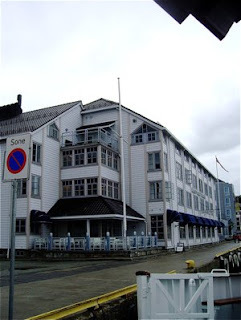 It is a new hotel built according to local traditions and with a distinct maritime theme. It was a nice stay, but the hotel failed to deliver that dream stay I expected. Clarion Hotel Tyholmen is located at Tyholmen, the old part of Arendal, among wooden houses dating as far back as 1650. 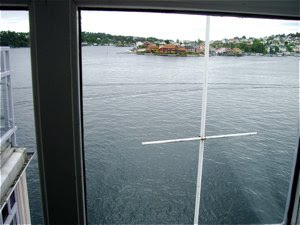 It has a superb view of Galtesund - the fjord leading from Skagerrak, into Arendal. The city's bus terminal is only a 5 minute walk away and the railway station is also just a short walk away. Receptionist gave excellent service at check-in, but failed to be present on several occasions when I needed assistance. At check out, we were three people waiting, and as there were no bell to call the receptionist. We had to call out for the receptionist to attend to us, hardly the best service you could offer an impatient guest. The service in the breakfast room had room for improvement as well, as they were a little slow to clear tables and replacing napkins, plates and cutlery. Room 401 was a medium sized room on the top floor of the hotel. Neutral design with pale yellow / cream coloured walls and blue wall-to-wall carpet. Classic furniture in birch wood. Two single beds placed along a matching head board in birch. Compact bathroom with bathtub, decorated with pink tiles and basin surrounded by a marble top. One small armoire. As this was a room for two, the armoire did not provide enough storage for us both. Part of it was taken up by the minibar. One basin in bathroom, but top provided more than enough space for your toiletries. Both hotel room and bathroom were well maintained. 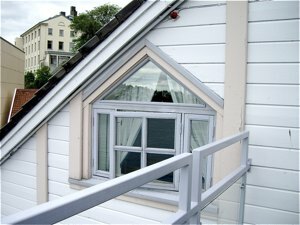 No cracked tiles, and no dust found on picture frames and other surfaces, and the inside of the window frame. We looked for air conditioning or any other sign of air processing, but did not find any. The room got very warm and we had to open the window in order to get fresh air during the night. Breakfast was included in the price, and we could enjoy an wide variety of foods during our early meal. There were bacon, sausages, and baked beans. Bacon was cooked rather than fried and crispy. Sausages was not properly fried. 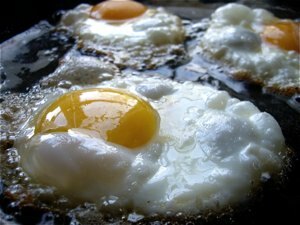 There were both scrambled and fried eggs, and I chose the latter. All my "warm" food was stone cold. There were soft and hard-boiled eggs as well. There were different kind of rolls and breads, and they even provided a gluten free alternative. For the health freaks there were muesli's, fruits and yogurt. There were freshly brewed coffee on each table and you could choose from orange and apple juice. Fitness studio in the city available free for guests. All the hotel was well maintained and well cleaned. 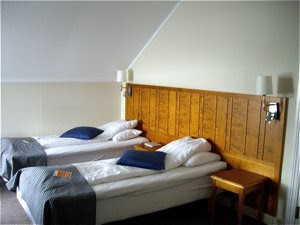 We paid NOK 1395 per room including breakfast. I would have expected a higher standard, more facilities, and a more sufficient breakfast for that price. We paid, in my mind, too much compared to what we got. Clarion Hotel Tyholmen does not offer facilities or a room standard that may defend paying a price like this. Room 401 with your own eyes?